The story of ramps versus stairs starts with Melbourne’s first railways. Built to link country Victoria with the markets of the growing metropolis, railways were built on the cheap – tracks laid at ground level and level crossings where roads crossed the tracks. Stations were also simple affairs – a pair of platforms with two tracks running through the middle, and a single station building on the city bound platform. Bridges over or under the tracks were rare, only being built in conjunction with cuttings through hills or embankments over valleys, which eased the grades for trains to climb. 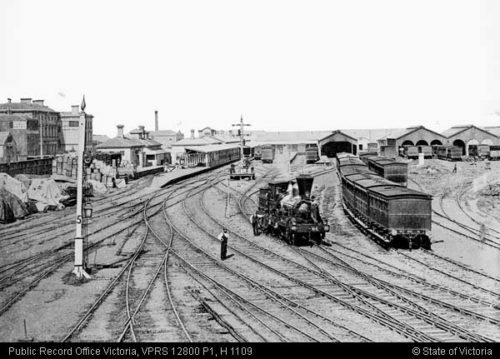 Yarraville station is an early example. Opened in 1871 beside the Anderson Street level crossing. Passengers accessed the platforms via the existing street network, but had to cross the tracks via the level crossing. 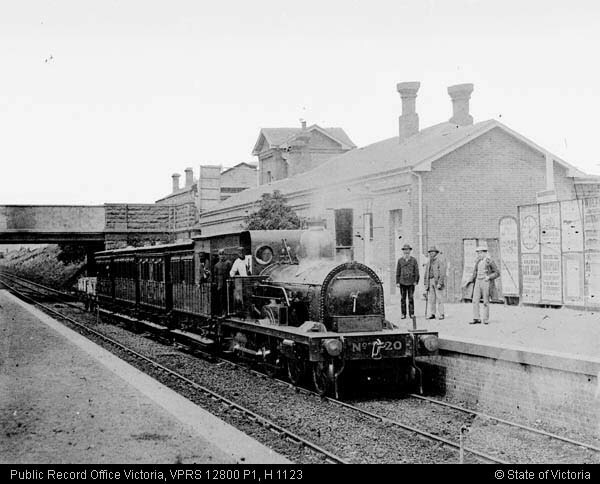 There were few exceptions to this configuration – one being South Yarra, which opened to passengers in 1860. 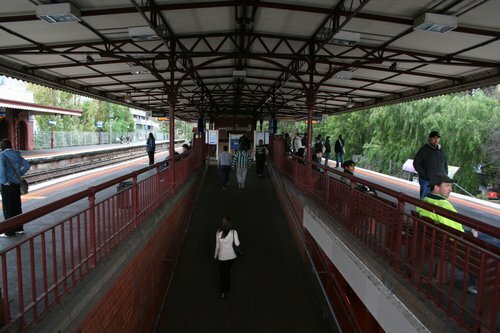 Located north of the Toorak Road overbridge, platforms flanked the two tracks, with steps linking the two. In the early years even the central stations of Flinders Street, Princes Bridge and Spencer Street didn’t have ramps or stairs – as terminal stations each track formed a dead end, with nothing to prevent ground level access between platform and street. But once the tracks linking Flinders Street Station to Spencer Street Station were completed in 1891, the question of having to cross the tracks at major stations emerged. A preference for ramps instead of stairs appears to have emerged early on, as this 1905 photo of the original Flinders Street Station shows. The Railway Inquiry Board in 1895 saw the ramps linking platforms at Flinders Street Station as inconvenient, with the Victorian Railways Engineer for Existing Lines, Charles E. Norman, being questioned by the chairperson over it. 1589. Can you name any station in a city, even down to 10,000 people, in any of the other colonies, where you have to go up ramps and along an uncovered bridge to catch another train? I cannot name such a station at present. But they just didn’t get the reason why the ramps were needed. 1595. You have read of the stations in London? 1596. I do not know of any one there except South Kensington where you have to climb up bridges and so on? Nearly all their large stations are terminals, and the trains arrive at what are called “dead ends,” and they go out again from the same place in the same direction that they came in. Our Flinders Street Station is a through traffic station, that is to say, the train from Essendon at present runs through Flinders Street Station to Brighton, and it is intended that a good many more trains shall run through in future. 1597. I can quite understand an underground railway such as the Metropolitan District Railway in London necessitating people going down stairs and upstairs to get to the railway line; but in a railway that is on the surface of the earth, I do not understand it? But wherever there is more than one platform, there must be some means for the passengers to cross the rails. 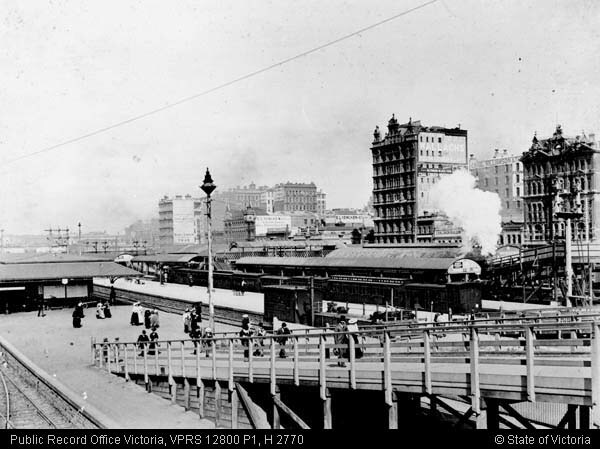 Once planning commenced for the present day Flinders Street Station in the late 1890s, a debate about crossing over the tracks via bridge or subway emerged, with Deputy Traffic Manager William Francis Fitzpatrick being questioned about the planned station. I think myself that a subway, on the whole, is the best, chiefly for these reasons – I am now speaking with regard to the comfort of the traveller; in the first place it is conceded on all sides that the greatest comfort to the traveller is to take him on the level. Next to that, bridges on that station will be very unpleasant places, owing to the large number of locomotives that will be passing to and fro, owing to the smoke and smell from them, and one thing and another. Then the question of whether it is easier to mount a ramp or go down the same height on steps is one that I am too young and active a man to settle, but, bearing in mind what little experience we have had, in that direction at several suburban places where we have subways, they lead to no complaint, and I think, on the whole, they are preferable, that is from the point of view of the travellers’ convenience. But the merits of ramps versus stairs was also debated. Victoria Railways Engineer for Existing Lines, Charles E. Norman, gave this reasoning when questioned by the Parliamentary Standing Committee on Railways in 1899. The central subway it is proposed to have approached by steps from all the platforms, because ramps would take up too much length of the platforms. The gradient is 1 in 10, and the length of the ramp about 136 feet. If a lift is found to be a necessity it can always be added; ramps are far easier and safer for old people than steps. Little did these engineers know, but their opinions on station design were to hold sway for many decades. 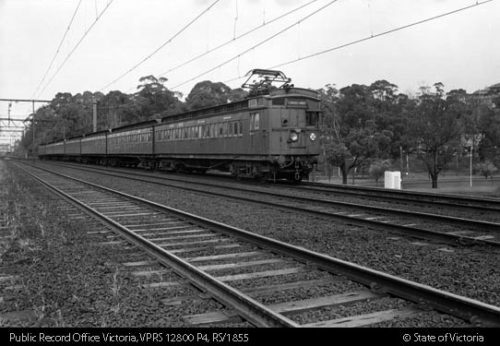 The start of the 20th Century was also the start of work to transform the Melbourne railway system from a handful of lines leading into the country, into a modern electric suburban railway. The current Flinders Street Station building was built between 1900 and 1910, with ramps chosen as the main access to the platforms from Swanston and Elizabeth Streets, but with stairs to the central subway due to space limitations. 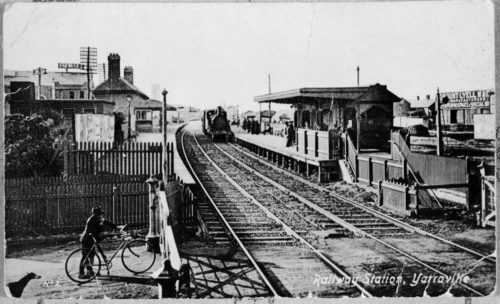 Footscray station was rebuilt in 1901, with a timber footbridge provided to link the four platforms at this important junction station. 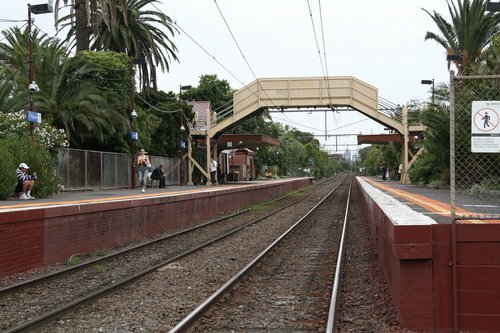 As part of quadruplication and regrading of the track between South Yarra and Caulfield completed in 1914, new low level stations were built at Malvern, Armidale, Toorak and Hawksburn. Footbridges carried passengers across the sunken tracks, with ramps leading down to the platforms. The tracks between Hawthorn and Camberwell were also regraded during the same period, with new stations at Glenferrie and Auburn completed in 1916. Access was at ground level under the elevated tracks, with ramps taking passengers up to the platforms. The facilities for suburban passengers at Spencer Street Station were also upgraded between 1918 and 1924 with the addition of platforms 11 though 14, linked to the main concourse via ramps to a new pedestrian subway. 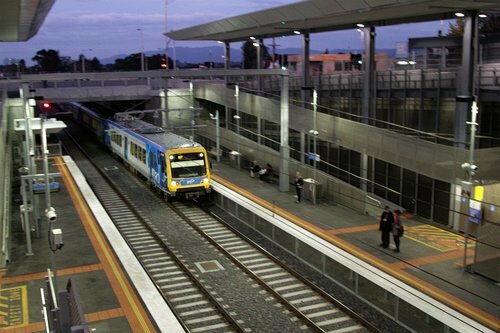 New stations built during this same period took into account the increased number of suburban trains now running in Melbourne. Ripponlea, opened 1912 shortly before electrification of the Sandringham line, followed the previous practice of two platforms flanking the tracks next to a level crossing, but added an overhead footbridge to allow able bodied passengers to avoid the closed gates. 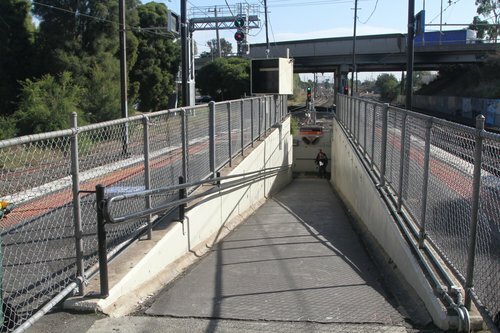 Similar works were completed at existing stations to make life easier for pedestrians stuck at level crossings – such as this pedestrian underpass beside the Koornang Road level crossing at Carnegie station. This footbridge at Westgarth station. And the pedestrian subway at Blackburn, built in 1928. A pedestrian subway is in course of construction at Blackburn. This will be completed shortly, and the necessity for passengers to cross the running tracks will then be obviated. 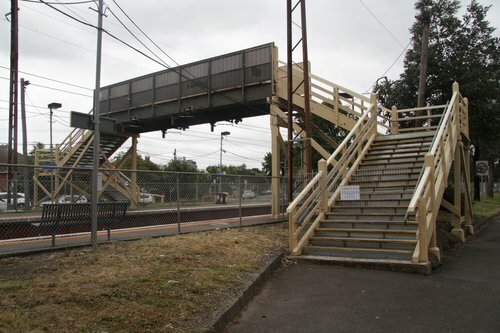 A few early grade separation projects were also carried out, such as the rebuilding of Middle Footscray station in 1928, which was provided with ramps for passenger access. The railways then entered a long period of underinvestment, thanks to World War II and the rise of the motor vehicle. One of the projects that ended this malaise was the rebuilding of Richmond station in 1952-1960. Ten platforms were provided, linked at each end to a pedestrian subway via ramps, as well an additional centre subway via stairs. A boom of grade separation projects from the late 1950s also saw the upgrade of many stations. Moorabbin station was lowered into a trench in 1959, with a footbridge carried passengers across the sunken tracks, with ramps leading down to the platform. Another rebuild was Albion station in 1961 as part of the Melbourne-Sydney standard gauge railway project. 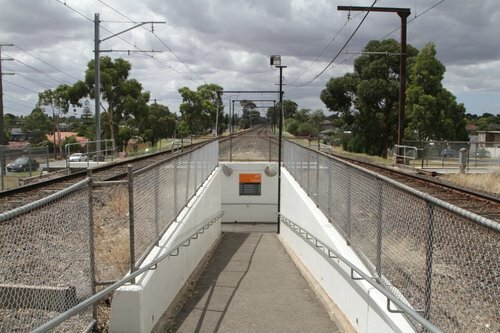 The Ballarat Road level crossing was replaced with a bridge and the pair of side platforms were replaced by the current island platform, with a subway passing beneath the tracks, with a ramp leading to platform level. The same island platform and pedestrian subway design was applied at Ruthven, opened in 1963. Tottenham, rebuilt in 1981 as an elevated station to remove the Ashley Street level crossing. And Werribee, rebuilt in 1983 with the extension of suburban services. 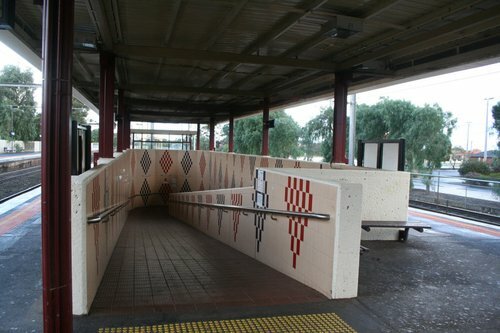 But a different design was applied at Yarraman – a new station opened on the Dandenong line in 1976. A single island platform between the tracks was still used, but here a concrete footbridge over the tracks was provided, with three long ramps linking each side to the street, as well as to the platform. 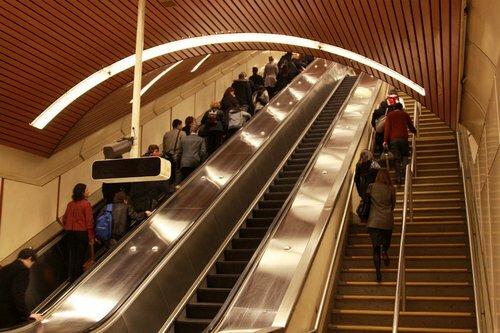 It took the construction of the City Loop in the 1980s to bring the first escalators and lifts to a Melbourne railway station – but given the stations were up to 40 metres below the surface, ramps or stairs were out of the question. This was followed in 1983-1985 by the rebuilding of sleepy little Box Hill station into a modern transport interchange. Escalators and lifts featured, but the station was still not completely accessible – steep ramps were the only wheeled route to platforms 1 and 4. It took until 1992 for accessibility to finally be taken seriously, when the Commonwealth Government passed the Disability Discrimination Act, with the aim to eliminate discrimination ‘as far as possible’ against people with disabilities. Since then, all upgraded railway stations in Melbourne have had accessibility built into their design, with varying measures of success. How steep are the ramps anyway? The gradient of a ramp is given as rise over run – for example a 1 in 20 gradient rises 1 metre for every 20 metres of horizontal distance. (a) Ramps may be substituted for stairways provided they conform to such of the requirements of this chapter for stairways as are applicable. (b) Ramps shall be in straight lengths with a landing at each change of direction having a length and a width at least equal to the width of the ramp. (c) Ramps serving as exits or giving access to exits shall have a slope not greater than 1 in 8. (d) Ramps used for purposes other than exit travel shall not be limited as to gradient. (e) Ramps shall be provided with an approved non-slip surface. 1 in 8 is a pretty steep grade – which seems to match the ramps found at older railway stations in Melbourne. But these ramps were an optional extra – it took the ‘Public Building Regulations’ 1958 to make the provision of ramps mandatory, at least in public buildings, and where it wasn’t inconvenient to do so. Provided that unless impracticable, at least one exit in every new building shall be provided with an incline or ramp at a grade not steeper than 1 in 8 from door-sill to ground level. It took until 1992 for the Commonwealth Government passed the Disability Discrimination Act, aiming to to eliminate discrimination ‘as far as possible’ against people with disabilities. These state that 1 in 14 is the maximum gradient allowed for a ramp – half as steep as ramps built in the past. So how did these accessibility regulations change the way railway stations were built in Melbourne? That is a story for part two! 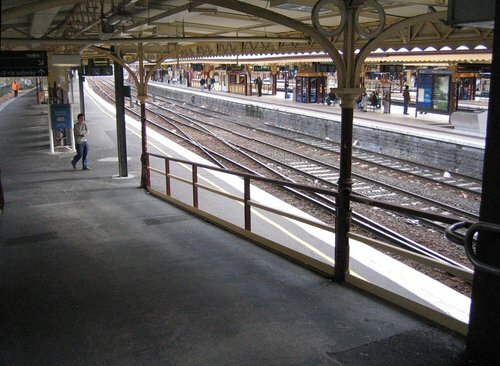 Daniel Bowen has a piece titled “Step-free” doesn’t mean DDA – compliant which starts on the topic of ramps, and then details the ways that inadequate information about station accessibility makes life difficult for people trying to plan a journey. For those interested in more of the early history of Melbourne’s railways, The History Of The Victorian Railways by Robert Lee (2009) is well worth the read, tying the railway story back to the development of the state as a whole. Here is the full text of Victorian Railways Engineer for Existing Lines, Charles E. Norman, being questioned by the Railway Inquiry Board in 1895 regarding the ramps linking platforms at Flinders Street Station. I cannot name such a station at present. The uncovered part is only part of the incompleteness. 1590. I need not tell you the ordinary passenger does not want to have to climb stairs and go along bridges and down ramps if he can avoid it; Can you name any station in the whole of Australia (we asked one Commissioner if he could name one in the rest of the world) where a station was so inconvenient as the Flinders Street one? Certainly. If I were to cudgel my brains sufficiently I could think of stations quite as inconvenient as this. I cannot think of one at the minute. 1591. Do you not think in a city such as this, with a population of 500,000, and where we are catering for the suburban traffic, that the least possible inconvenience that we can put in the way of ordinary travellers is what we should aim at ? 1592. Take Spencer Street; you walk in on a level road, and go to any platform you require without having to go up steps? You cannot do that now that there is a bridge from Spencer Street. 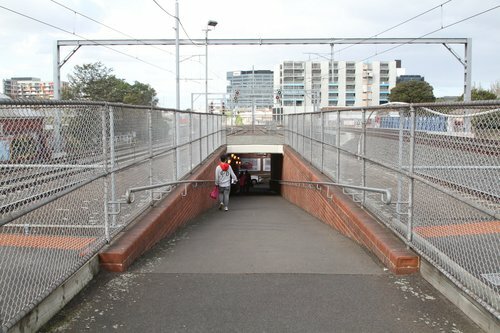 You cannot go to the suburban platform in Spencer Street without going over a bridge. 1593. The old way the Spencer Street station was you could do it? That was before the suburban traffic was carried through. 1594. At Princes Bridge it is the same, and you can get out of any train from there. That being so, do you think it wise that you concentrate the bulk of your traffic in a station where you have to walk up steps and so on ? It is unavoidable to have a foot-bridge or subway where you have to provide for through trains. The passengers must cross overhead or underneath. Victorian Railways Deputy Traffic Manager William Francis Fitzpatrick being questioned by Parliamentary Standing Committee on Railways in 1896 on the merits of bridges or subways for pedestrian access at railway stations. 781. With reference to bridges or subways, which are the most convenient? I think that is largely a matter of opinion. 782. I mean, convenient for you, as Traffic Manager, wanting to give the travellers every convenience to induce them to travel by the trains ? I think myself that a subway, on the whole, is the best, chiefly for these reasons – I am now speaking with regard to the comfort of the traveller; in the first place it is conceded ou all sides that the greatest comfort to the traveller is to take him on the level. Next to that, bridges on that station will be very unpleasant places, owing to the large number of locomotives that will be passing to and fro, owing to the smoke and smell from them, and one thing and another. And Victoria Railways Engineer for Existing Lines, Charles E. Norman, being questioned by the Parliamentary Standing Committee on Railways in 1899 on the ramps at the new Flinders Street Station. 27. How will the people get up and down? The central subway it is proposed to have approached by steps from all the platforms, because ramps would take up too much length of the platforms. 379. What is the width of the first ramp? 10 feet, the second 10 feet, the third 10 feet. The gradient is 1 in 10, and the length of the ramp about 136 feet. The first is not quite so long, it is 120 feet. The present ramps, I believe are 1 in 10, but they may be 1 in 8. we have a ramp leading from the Swanston street footbridge to each platform, we have five ramps altogether. 380. Do you propose that they shall all walk? Yes. Of course if a lift is found to be a necessity it can always be added; ramps are far easier and safer for old people than steps. A couple of random comments. First, the photo of Yarraville. Actually, if you look carefully, the Down platform (to Williamstown) can only be accessed from a subway via stairs. The reason for this is that there is a goods yard and a siding behind the platform. The subway was only removed in the 1990s, although street level access had long been added. The general theme, however, is correct. Second, footbridges were being pushed for, and provided, to cross the line by the mid 1870s, even at level crossings. The railways preferred to provide footbridges as they were cheaper than subways. However, the local council often initially suggested a subway. Footbridges invariably had stairs, while subways would have ramps if there was room. Third, there was quite a bit of discussion over ramps, stairs, footbridges, and subways at Flinders St in the decade long discussion leading up to the rebuilding. The standard was the ‘fat old lady’ (note, not the fat old gentleman) who struggled with stairs and steep ramps. The next trope was passengers with lots of luggage. Interestingly, if you read around CE Norman’s evidence, you will find that the parliamentarians asking him the questions were well aware that 1 in 10 was too steep for the aforesaidmentioned old lady. Fourth, it was interesting how little Melbournians of the time knew about the UK. There were (and are) plenty of major stations where the only access to the platforms was via footbridges/subways (e.g. Manchester New St). Thanks for the correction regarding Yarraville – I’d forgotten all about the goods yard, despite the time I once spent chasing down the remnant signal in the park next door! Re: footbridges thanks for that extra info as well – my usual research sources only go back as far as electrification, with the various signal diagram websites only going back to the turn of the century at best. I noticed the “passengers with luggage” trope as well, and found it quite amusing – especially the level of concern for porters dragging luggage trolleys through the station subways! Really interesting post. Thanks for the information. Oh, and I meant to say that I think you are right that the discussion about the new Flinders St station (which took place fitfully over about a decade from around 1895 to around 1905) crystalised the idea that ramps were provided instead of stairs, and that subways were preferrable to footbridges. 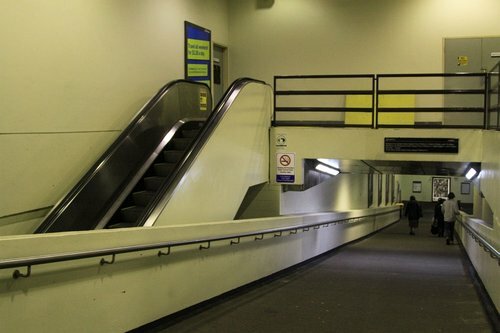 Correction Marcus – The centre subway at Richmond has stairs, not ramps. 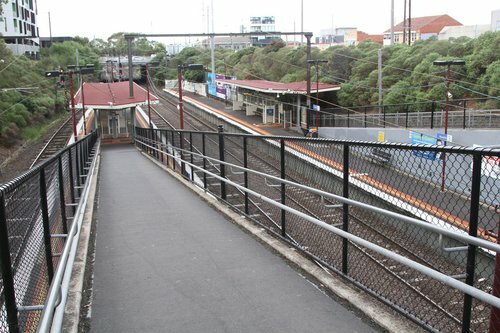 Brighton Beach is another interesting one, with stairs on the pedestrian footbridge providing direct access onto platforms 1 & 2 from the City end, a subway beside the South Rd level crossing and at grade crossing at South Rd. Thanks for the correction regarding Richmond – the centre subway is a dank place. Flinders Street must’ve had ramps from Swanston St from early on, since the eastern suburban lines were tunneled under Swanston Street from 1865 from memory – I havnt seen but I imagine there were timber things for the decades that Flinders Street was a collection of sheds. So I cant imagine why they were arguing about whether or not to have ramps, when they were already there, perhaps someone thought stairs alone would do ? I also understand that the platforms (and so also the ramps from Swanston Street) were rebuilt in their current form in 1888, along with the completion of Princes Bridge, which rises up considerably in order to go over the rail lines. Hopefully the answer lies there! 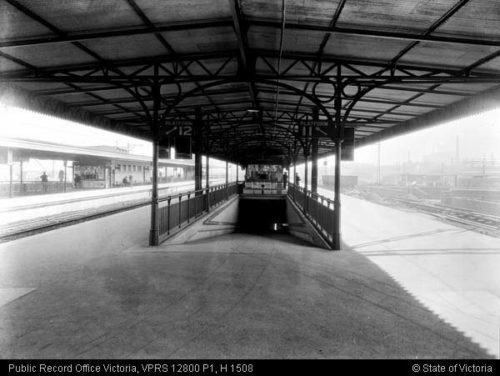 – 1854: station opened with single platform facing Flinders Street. So in 1865 there was so many people travelling across Swanston Street and traffic along Swanston St that it was felt worth excavating these culverts, but now there is not enough to justify exits from Platform 1 to east of Swanston st? As with SpencerSt/SouthernCross I feel we’ve gone backwards in access despite a more crowded CBD than ever before! The culverts under Swanston Street were for tracks to pass under the road, avoiding a level crossing, and not for pedestrian use. 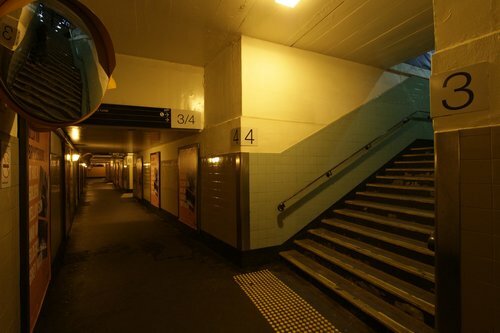 I am curious as to what pedestrian access did exist under Swanston Street in the years that followed – platform 12 and 13 had their own access to Batman Avenue, while Princes Bridge Station (platforms 14, 15 and 16) had access to Flinders Street. Dont remember 12 / 13 having an exit to Batman, maybe that was gone by the 80s ? But I did discover that if you wanted to, you could walk along Platform one from past Elizabeth Street all the way to nearly Russell Street (by which time I think it had become Plat 14); I did that once just for fun, so if Id wanted to I could have got off my belgrave / lilydale train from East Camberwell, used the degraves subway to get to Plat 1, then walked along it to then use the ramp up under the Gas & Fuel plaza to end up on the southeast corner of Flinders & Swanston. But faster to just go the more direct way, even given waiting at the lights to cross Swanston. Plat 1 (and 14, 15, 16?) is now of course the main exhibition space of ACMI. I should have written Passenger access to East of Swanston street because you had to have at least a Platform ticket but … You can still walk from Degraves st along Platform 1 under Swanston st and occasionally a train stops on the other side. I’m hazy about the platform numbers now but I occasionally left Princes Bridge just before Russell Street. Platform 1 extends West to nearly Queen st but that was used for freight and probably not even that now. You can get to Batman Avenue from the Elizabeth street tunnel and along the river bank but that’s a long detour. I don’t recall any other way either. http://wiki.prov.vic.gov.au/index.php/VPRS_12800_P3_ADV_1330 shows the Russell Street entrance, actually on the south side of Flinders st. When I used it, it was at the east end of the shops, CES? etc which ran to near the steps up to the roof of Princes Bridge Station. This is the only obviously relevant result I saw, but I am sure there’d be plenty more & newer images online. Constructing entrances to platforms from the eastern side of St Kilda Rd and (for platforms 12-14) Russel St is now severely hampered by Federation Square, despite it being a good idea. They would relieve some of the pedestrian pressure on the crossings between the existing station and the trams and on the western side of the Flinders St/Swanston St/St Kilda Rd intersection. Charles Edward Norman d 1922 is buried at Brighton Cemetery. The E. was for Ernest. Extremely interesting post. 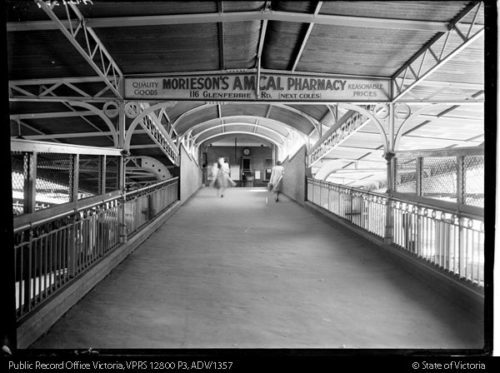 Fascinating how Sydney went with mainly footbridges with a few subways – but all using stairs. 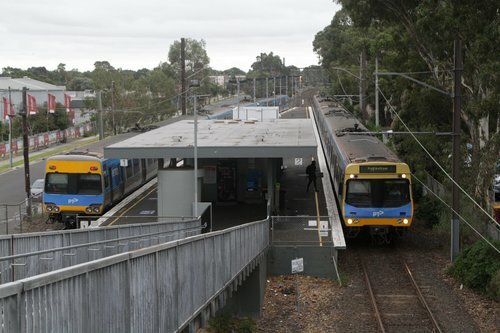 Only one major station had ramps – (and has kept the to this day) – Strathfield with 8 platforms. While travellers may have preferred subways when bridges exposed them to smoke & cinders, new or rebuilt stations never have them now as some folk feel unsafe in them. (Although perhaps the subway under Sthn Cross, now storing rainwater, might have prevented at least one pedestrian fatality if still open.) Watergardens lacking ramps to platform 2 & 3 despite plenty of room led to PTV recently running taxis from/to St Albans for disabled people while redoing the lifts. It’s overhead concourse extends only across the less busy Sydenham rd, while the shopping centre later built a third arm enticingly close to but not over the busy st. I wonder if corporations might pay for overpasses if they could advertise on them for decades? There ought to be a much stronger warning about Heyington. The ONLY egress from the outbound platform is a (usually locked?) gate to St Kevin’s and steps up to the bridge. If someone gets off the last train and can’t climb steps they’ll have to wait for hours or ring someone for help. AFAIrecall without a toilet either! 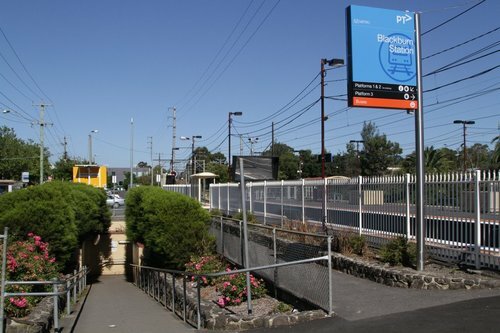 Dandenong and Watergardens are interesting stations – both have platforms served by a single lift, but it took the upgrade of Laverton in 2009 to bring the issue of faulty lifts to the forefront. 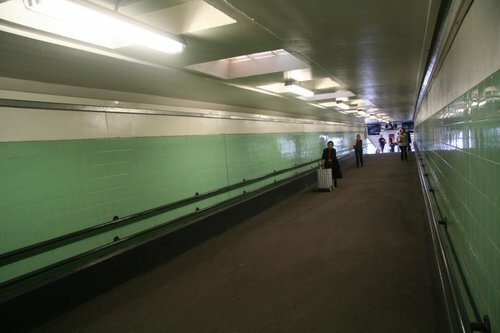 I miss the old Spencer st subway. I used that every day for 15 years. I also used North melbournes ramps for many years. Those ramps were my daily exercise. These days were all get fat thanks to lifts every where. I don’t miss the scary elevators at Parliment though! Those are huge!!. Parliment is way past due for a full make over. 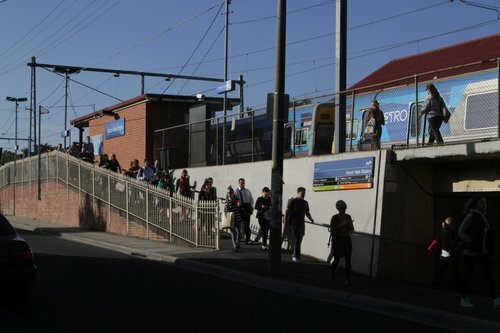 You’re probably better off sticking with the ramps at North Melbourne station, given how often the escalators fail! I’m tempted to write, not just Parliament Railway Station. I’m not sold on term limits but … maybe we should change some procedures at least. Perhaps Taser those making stupid noises while another member supposedly has the floor? One of the reasons I prefer subways to overhead bridges, is the total height difference. You can build a subway which is only about 2.5 metres below track level, if you need to. Footbridges on the other hand are higher, and getting even higher in new developments for some reason. Maybe better clearance for the wires, or allowing very tall trains underneath. Some of the new ones are like climbing mount Everest, you can see for miles around. Current standards require 5.75 metres clearance on suburban lines, and 7.1 metres for interstate freight lines. Older footbridges seem to be far lower than this – but that is a story for a future post. At least a few hours ago the PTV website was reporting that Benalla railway underpass was flooded. On the other hand, underpasses are less visible to very large creatures or flying creatures or machines. I guess the highest ascents from ground level to cross a railway line would be if they decided to have a bridge between elevated platforms such as Flemington Bridge. Fortunately Blackburn, Tottenham and Holmsglen etc have island platforms. I guess the highest ascents from ground level to cross a railway line would be if they decided to have a bridge between elevated platforms such as Flemington Bridge. Fortunately Syndal, Tottenham and Holmsglen etc have island platforms. 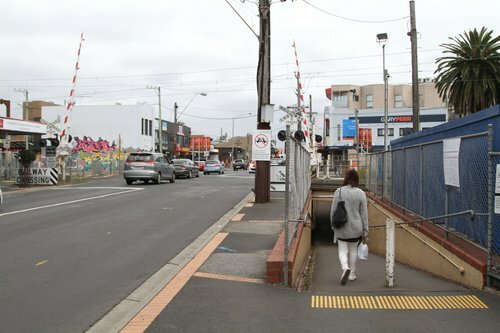 Why did Melbourne build so many platforms with only one access point at one end but pedestrian crossings at both ends? Fare evasion can’t have been the only reason. Burnley and Ringwood East are prime examples, where a pedestrian crossing or underpass goes right past the platforms, yet there is no legal access unless you want to walk along 7 carriages worth of platforms to find the “proper” entrance at the other end. Lilydale is also notable for having the down end exit cut off from public use despite it being a valid exit for decades (and even having its own Metcard validator back when those still existed). 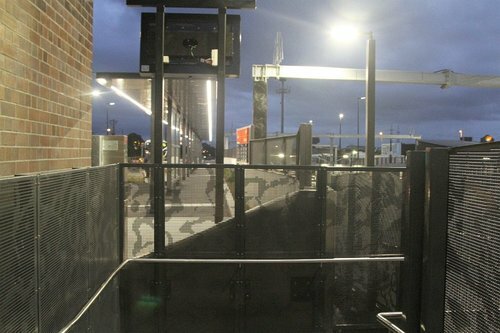 The designers of Mitcham station should be shot for putting a fence at the top of the zigzag ramps which are right next to, and level with, Mitcham Road, which has a footpath going right past the ramps of both platforms. Heatherdale received additional exits, but they didn’t put a subway under it, so people who parked their cars there have to go all the way up the ramp, around the concourse and down the other ramp. Doesn’t matter which side you parked on since it’s a side platform, you will be walking two platform lengths 50% of the time to get to or from your car. Back in the ‘good old days’ station staff manned the station exits to check tickets – so I’d blame that. I’ve visited Heatherdale since the rebuild, and didn’t notice the half-arsed nature of the secondary exits – good pick up! One of the silliest W.hy T.he F.oolishness things I recall done recently at a railway station was when someone decided to resurface the Elizabeth st ramps at Flinders st, replacing or covering the bitumen that had worked for about a century with ceramic tiles. As soon as they got a bit muddy the only way to use them half safely was by holding onto a rail. I’d guess this was in the 1990s, certainly after accessibility had become a consideration. Perhaps someone decided they’d be cheap to clean, or looked less dowdy! They also resurfaced the platforms themselves in tiles. Interestingly enough this was the opposite of Southern Cross Station – it was intended to have tiled platforms, but received asphalt in a cost cutting drive. 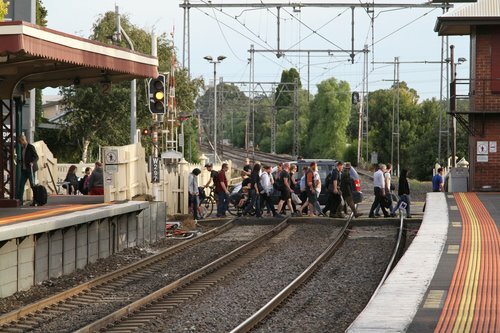 In regards to bentleigh McKinnon stations, they were filled in due to I think from memory a sexual assault or two towards females and possibly a mugging or two. Can’t remember exactly what happened but I grew up in the area and remember the debate in the community about closing the subways. The debate went on for a while before they decided to backfill them and turn them into pedestrian level crossings. Even though Ormond station never had the subway to the island platform removed I remember hearing about at least one news report saying a lady was assaulted as well. Subways worked well when society was a bit more civil and simple back in the early and mid 20th century but not today. They are dark places for people to be assaulted as apposed to an overpass.